Popular science books have been around at least since the Middle Ages, when illustrated “bestiaries” were a big hit, highlighting the most bizarre creatures found in Nature. Many such books mixed reality with myth, but entomologist May Berenbaum, who also serves on the Exchange’s advisory board. 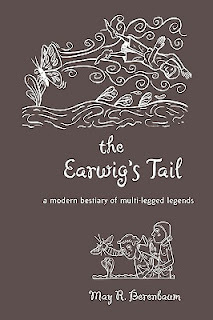 shows that truth is definitely stranger than fiction in her new book, The Earwig’s Tail: A Modern Bestiary of Multi-Legged Legends. Take a tour with May through insect urban legend and find out the underlying real-world science behind these fascinating creatures — often more fantastic than the wildest legend. Frankenbugs, brain-boring earwigs, Spanish fly, and (ewww!) the California Tongue Cockroach are just a few members of this compendium of buggy behavior. In the excerpt below, Berenbaum talks about one of her favorite buggy B movies, and what a “fly-scale view” might really look like. In just about every insect fear film ever made, there’s an obligatory insect-eye view of a potential victim. There’s a general recognition on the part of filmmakers that insects possess compound eyes with many facets and the way this anatomical feature is rendered in movies is through use of a multi-image filter lens, which, depending on film budgets, repeats an identical image tens or dozens or hundreds of times. In Empire of the Ants, director Bert I. Gordon has his giant ants, created by exposure to to toxic radioactive waste, eyeing dozens of Joan Collinses in as many wet, clingy blouses to great effect. In reality, what insects actually see wouldn’t make for a very scary (or titillating) scene in a movie. As far as entomologists can determine, the insect compound eye produces a mosaic sort of image, like the image created by thousands of dark and light dots in a black-and-white newspaper photograph. Although no one is absolutely certain, the general belief is that insect eyes can’t create images with high resolution, but that the compound eye is exceedingly good at detecting motion. So those giant ants in Empire of the Ants probably didn’t have a very clear picture of Joan Collins, but they could probably see with relative ease the heave of her bosom as she screamed. Heaving bosoms aside, insects and movies have a long history of association, dating back even to the earliest days of cinema. A fly, for example, is said to have inspired the invention of animation around the turn of the 20th century by Segundo de Chomon, a Spanish filmmaker. Filming intertitles a few frames at a time for a silent movie, the filmmaker noticed the apparent jerky movements of a fly inadvertently included in the footage and realized that repositioning an object between each frame of film creates the illusion of motion when the film is played back at normal speed. Berenbaum’s fascination with the insect world goes beyond her scientific research; she’s also a fan of film and TV with insects-gone-wild themes. Her favorite episode of the The X-Files, for example, is “War of the Coprophages,” in which a drop-dead gorgeous USDA entomologist is named “Bambi Berenbaum” in her honor. One of her favorite recent movie scenes occurs in Indiana Jones and the Kingdom of the Crystal Skull, in which Indy and his son encounter scorpions in a Mayan ruin. Indy Jr. panics at first, but upon hearing the scorpion was large, his father shrugs and tells him, “It’s the little ones you’ve got to watch out for.” That happens to be correct, and now millions of movie fans know it. Berenbaum also collects classic B movies about giant insects, human-to-bug metamorphosis, and so forth. Her favorite insect movie of all time? Bert I. Gordon’s Beginning of the End. Berenbaum is at the University of Illinois, so naturally she has a soft spot for this flick. “It starts out in central Illinois and ends up on Michigan Avenue in Chicago, with giant grasshoppers heading to Lake Michigan.” Buggy B movies don’t really get much better than that. ‹ Physicists Looking Forward to "Flash Forward"